The mapping of a continuous variable onto a discrete binary variable is done by defining logic levels, as shown in figure 1.23. The first gate is called the driver and the second gate is called the receiver. The output of the driver is connected to the input of the receiver. The driver produces a LOW (0) output in the range of 0 to VOL or a HIGH (1) output in the range of VOH to VCDD. If the receiver gets an input in the range of of 0 to VIL, it will consider the input to be LOW. If the receiver gets an input in the range of VIH to VCDD, it will consider the input to be HIGH. 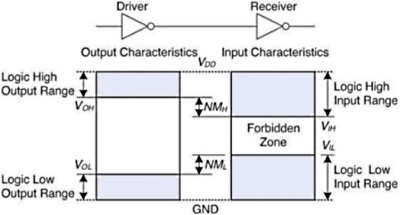 If for some reason such as noise or faulty components, the receiver's input should fall in the forbidden zone between V,IL and VIH, the behavior of the gate is unpredictable. VOH, VIH, VOL, and VIL are called the output and input high and low logic levels. VDD stands for the voltage on the drain of a metal-oxide-semiconductor transistor, used to build most modern chips. The power supply voltage is also sometimes called VCC, standing for the voltage on the collector of a bipolar junction transistor used to build chips in older technology. Ground is sometimes called VSS because it is the voltage on the source of a metal-oxide-semiconductor transistor. DC indicates behavior when an input voltage is held constant or changes slowly enough for the rest of the system to keep up. The term's historical root comes from direct current, a method of transmitting power across a line with a constant voltage. In contrast, the transient response of a circuit is the behavior when an input voltage changes rapidly.